Many of us (including myself) often make use of the huge amount of information found in books and the internet for enrichment, to learn, and to be inspired. These tools are wonderful—if you know how to use them, their potential contribution to your careers can be enormous. Many of us really love to observe and analyze pictures of dishes created by various chefs from different restaurants that we admire or interested in throughout the world. Most of those pictures are photographs taken by professional photographers, dishes that underwent meticulous care for picture-taking purposes. They are important—they give us tools to know a chef’s work style and manner of thinking. But for me, a professional chef, it is often more interesting to understand what happens in reality; to receive visual information that allows me to understand the ‘facts on the ground,’ such as the audience experience, how the dish leaves the kitchen in real time—with all that this implies—and to help me I have followed blogs by restaurant critics. Food and restaurant critic bloggers tend, while studying the meal, to photograph the dish as it reaches their table; the product appears in its natural manifestation, in real time and under the pressure of kitchen challenges and the restaurant’s daily reality. 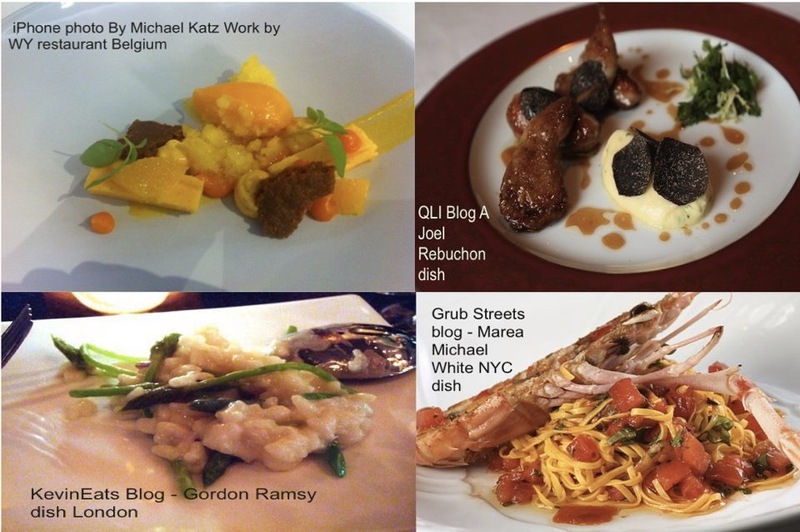 I attach here a number of pictures that I took from restaurant critic bloggers; in them you’ll be able to see dishes by well-known chefs that were photographed in real-time at restaurants. This entry was posted in chef, dish plating, restaurant, Uncategorized and tagged chef, cooking schools, cooking tips, dish plating, food plating, food presentation, kitchen team, learning to cook, plating, restaurant management. Bookmark the permalink.